Day One: April 8, 2000: Left home, North Andover, Massachusetts at 11 am. Only drove 300 miles. Hard days drive. Exhausted. Missed exit somewhere on the New Jersey turnpike. Arrived at my very first hostel sometime around 10pm. It's called the Tyler State Park Hostel. Located in Newtown, PA. It's a beautiful farmhouse (only $12/night). It was snowing hard when I woke up. The only other hosteller left early. The manager, Susan, made me homemade pancakes w/fresh blueberries & strawberries! What a great introduction to the "hostelling experience!" April 9th: Drove from Newtown, PA to Derwood, MD where I had planned to stay w/aquaintances. I decided to continue on to Virginia Beach...Too late to find a place to stay, so I continued to drive on to Brunswick, GA. First lesson learned: DON'T DRIVE ALL DAY & ALL NIGHT!!! April 10 & 11: Ahhh! Sleep! Arrived at noon on the 10th at Hostel in the Forest in Brunswick, GA. ($13/night) I stayed 2 nights. 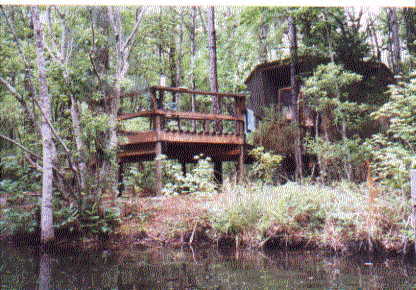 I chose my own private cabin w/deck overlooking a serene pond. Hated to leave. Next day drove 206 miles to Titusville, Florida. (this "mini-journal" only covers one trip. "Roadtrip 2" starts on the "Home Page". and please sign the Guest Book! April 12th: Manatee Hammock Park Campground, Titusville, Florida. Located right across the bay from Kennedy Space Center. Visited center. Space Shuttle lift-off was postponed. Returned to tent that night in pouring rain. Noisy, intoxicated person in campsite across from mine. Next day drove 254 miles to Florida City. April 13 & 14: Everglades Hostel in Florida City. Visited the Coral Castle, Monkey Jungle, went on glass bottom boat ride in Coral Reef Park in Key Largo. April 15 - 20: Drove 126 miles to Key West. Stayed at the Key West Hostel (also called Sea Shell Motel). Sat on the warm sand & drank a cold Marghitta w/extra salt & watched the sun set over the ocean. Visited Hemmingway's House, Mallory Square, toured the island. April 20 - 25: On way to Spring Hill, Florida, visited Lake Okeechobee and went on an Everglades Air Boat tour--saw alligators very close up. While in Spring Hill I stayed w/warm & generous friends who shared their home & Easter dinner with me. Visited Weeki Wachee Park and went to Crystal Springs to the manatees. Drove 434 miles to Spanish Fort, Alabama. April 26: (Passed first time zone--gained one hour.) Experienced southern hospitality once again when I met new friends "Richard & his wife Pat, hosts at the Meaher State Park Campground on Mobile Bay in Spanish Fort, AL. April 27: Frenchman's Wilderness Campground in Butte LaRose, LA. Nice pool. It was always a relief to find a place with a pool to cool down in. Drove around New Orleans, got car oil change. Visited French Quarter. Drove 390 mi. to Fentress. Texas. April 28: Leisure Camp Campground in Fentress, TX. Hot, no pool. Both bathrooms were being repaired, no showers. And...let's just say, "The natives were restless." Drove 55 miles to San Antonio, TX. April 29 & 30: San Antonio Hostel (also called Bullis House) Ahhhhh a pool! Saw the sights w/fellow hosteller who came from Canada. Enjoyed the Riverwalk & the Alamo. Drove 341 miles to Fort Stockton, TX. May 1: On my way to Fort Stockton I visited Del Rio, TX and crossed the border into Acuno, Mexico for a pack of cigarettes. (I have since quit smoking.) 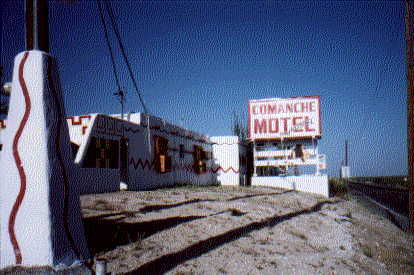 Arrived exhauted at the Comanche Motel Hostel in Ft. Stockton. An oasis in the desert after driving all day. Private room (it wasn't really private, but there were no other hostellers, so I had the place to myself), air conditioning, comfortable bunk, shower & cable TV--who could ask for anything more? Heaven! Especially for $10/night! And the managers were Sooo friendly! May 2 & 3: Long, long, long, endless day. Left Comanche Hostel, visited McDonald Observatory en route to Marfa, TX to see the Mystery Lights. Arrived in Marfa around 2 pm--way too early. Marfa is very small. The sign in the museum window said "Open on Tuesdays". And I wasn't there on a Tuesday. Even the Chamber of Commerce was closed. Where is everybody? The Mystery Lights couldn't be seen until after dark--so what could I do in the meantime in the desert for 7 hours? Drove to nearest town---Alpine, TX. Beautiful landscape, treeless rolling hills. Wasn't accustomed to seeing so much treeless land. It was so "unlike" New England. (I love New England also). But, Wow-there was just so many unusual things to see in all these places where I had never been. Anyway, I stopped in an air conditioned restaurant and splurged. Then went to the Sul Ross State College to use their library. Spent a couple hours there writing a 14 page letter. Drove around the town. Finally around 9 pm, I saw the "Mystery Lights of Marfa". It was too late to find someplace to stay. Too cheap to pay for a hotel, and I wasn't going to put my tent up in the dark in the desert. So I drove ALL NIGHT again! Saw some other strange lights in the sky around 1 am. It was so pitch black out. No street lights, no houses, I couldn't see anything except my car headlights on the road. Almost hit a deer. 5 am: Arrived just outside El Paso, TX. Pulled into a rest stop & tried to sleep for a couple of hours. Put the car seat back, tried to get comfortable. There were trucks and other cars parked there--everyone trying to sleep. I watched the sunrise over the city, wondered what the day would bring. Found the El Paso Hostel (located in the Historic Gardner Hotel) about 8am. Finally--a bed! Not so fast...the manager introduced me to my roommate, Yoko from Japan. He explained that she couldn't speak english very well, but that she wanted to ask me if I would rent a car with her so she could see White Sands. I told him I have a car. Yoko & I ended up driving to White Sands. I didn't realize that it was around 100 miles away! Still no sleep! Stayed at the El Paso Hostel for 2 or 3 days--can't remember. Also visited Juarez, Mexico. Finally drove 244 miles to Roswell, New Mexico. May 4 -- I think: Pitched my tent in the Bottomless Lakes State Park Campground. Cool, clear water in the middle of the desert. Beautiful & very quiet. Visited Carlsbad Caverns, and the UFO Musem in Roswell, NM. May 5 & 6: Oscuro high Desert Hostel Ranch, Oscuro, New Mexico. Never thought I could love a desert so much. Peace & solitude. Totally quiet. Visited the Three Rivers Petroglyphs, and Valley fo Fires. May 8: Took the Enchanted Highway to Santa Fe, stopped in Los Alamos just before & during the fire evacuation, stayed in the Abominable Snowmansion Hostel (Arroyo Seco Hostel) next to Taos, NM. Visited Native American Pueblos, and Rio Grande Gorge State Park. Drove to Durango, Colorado. May 9 Day 30--it's been one month On The Road! Durango, Colorado. Durango Hostel. May 10: Another day that I'll never forget! Left Durango, visited Mesa Verde national Park, visited Four Corners (in the desert where Utah, Colorado, New Mexico, & Arizona meet), then decided to take another little unplanned side trip. Headed north--big mistake! Now, looking back, I'm glad I did it. But at the time I wasn't prepared for this trip into the Canyonlands of Utah--I had no map. I had no idea what I was in for! I figured I'd just go north and ,after a few miles, end up somewhere above Lake Powell. I figured wrong! Drove through Blanding, Utah to Natural Bridges national Park--campground full. Forced to drive through Glen Canyon. The road just kept going & going & going. No turn offs. No short cuts. Now I know for sure that you can NEVER have too many maps! Without a map, I had no idea how far I had to go before I came to civilization. Canyon driving is tough! Extremely windy. The road was winding, with steep canyon walls rising straight up, way, way up with no place to pull off the road. So I didn't get photos. There were many road signs warning of "falling rocks". And it was getting dark. FINALLY, ended up in a place called Hanksville, Utah. Sand storm. Forced to stay in motel--the only motel that I stayed in during the entire trip. But I must admit it felt GOOD! The next day I drove 253 mi. to St. George, Utah. After driving the canyon, this drive was easy! May 12 & 13: Las Vegas Independent Hostel. I don't gamble--I don't like even spending money on things I need--I can't imagine gambling it away. But I had planned on seeing Star Trek: The Experience at the Hilton and visit Quark's Bar. And I did. I then called my friend in Sea Tac, Washington to tell him about the show. He said he'd come to Las Vegas and see it with me the following week. So I said I'd wait. May 14: Seeing as I was going to be in Las Vegas for a week, I figured I'd go check out the other hostel--Las Vegas Backpacker's Hostel. Nice big pool. But way too crowded for me. It's more of a partying hostel. I couldn't wait to get back to the quiet Independent hostel, and to the people I had met there. May 15 - 21: Stayed at the Independent Hostel. No pool, but quiet & and it was a good, safe "base camp" for checking out the sights. Took a day trip to Hoover Dam. Took a 400 mile day trip through Death Valley & Scotties Castle, drove past Dept. of Energy Yucca Mountain (Nuclear dump site), then back to Las Vegas. I didn't realize that my Death Valley day trip would end up being 400 miles long! During my 10 days in Vegas, I went to the buffet at the Stratosphere & went to top, walked around a lot, saw Blue Man Group at the Luxor, an got to experience what it feel like to get "heat stroke". Besides seeing only the "glitzy" Vegas, I also visited the college to use the library, the post office, the grocery stores, all the Wal-marts and Dollar Stores. Vegas has one of the biggest Dollar Stores that I've ever seen. May 22: Took Extraterrestrial Highway to Rachel, Nevada. Camped near the Little AleInn/Groom Lake Area 51. Next day drove 262 mi. to Mammoth Lakes, California. May 24: Left Mammoth Lakes, drove 4 hrs. to Lake Tahoe--too crowded. Drove another 5 hrs. to Alpenrose Cottage hostel in Mt. Shasta, CA. Nine hrs. of tough mountain driving! I think the mountain speed limits are way too fast! Arrived at Alpenrose Hostel totally exhausted and stressed out. I should slow down. But it's important to find a quiet place to rest. Mt. Shasta was perfect. Located practically at the base of snow capped mountain. 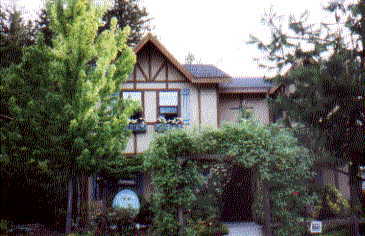 May 25: McMenamins Edgefield Hotel/Vineyard Hostel in Troutdale (near Portland), Oregon. Visited Mount St. Helen's & Coldwater Lake. Above: Coldwater Lake on Mount St. Helen's. May 26 - June 1 Stayed at my friend's house in Sea Tac, Washington. June 2: Drove 200 mil. to Rainforest Hostel in Fork, WA. Drove around the whole Olympic Peninsula National Park (approx. 400 mi). Saw the Pacific Ocean for the first time. Visited the HOH Rain Forest. They get 12 ft. of rain per year--yes, 12 FEET! June 3: After staying at the Rainforest Hostel for 1 night, I went back to my friend's house--stayed one more night then got itchy feet--time to move on! June 4: Drove to Canada. Stayed at the Jerico Beach Hostel in Vancouver. Started thinking about driving to Alaska. Decided to stay at Birch Bay Hostel to think about it some more. Driving to Alaska was a big decision. June 5 - 9: It's been 60 days "On The Road"! Birch Bay Hostel in Birch Bay, Washington. Met a new friend, Wayne, he's the manager of the hostel. We visited Blaine, WA, and the Peace Arch, the International Sculpture Expedition, and went for a ride on the "Plover". Still contemplating driving to Alaska. OK, Go for it!! June 10: Left for Alaska. 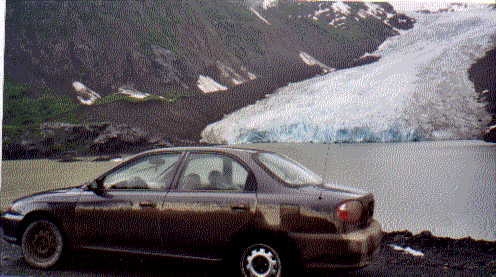 I'm doing it--driving to Alaska! Stayed at a campground in Cache Creek in British Columbia, Canada. Visited hell's Gate Airtram. Two hour holdover on the Frasier Highway due do a jack-knived 18 wheeler. Mountains! June 11: Mile "0" Campground, Dawson Creek, BC. Beginning of the Alaska Highway. Only another 1,500 mi. to Fairbanks! Drove by crystal green colored Muncho Lake, in BC. Never seen a lake that color. Unbelievably beautiful! 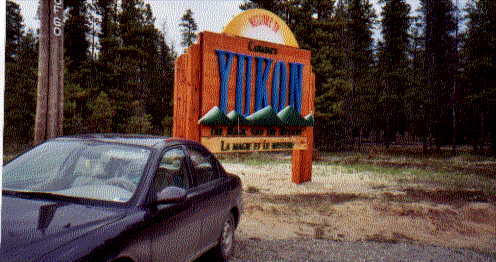 June 12: Watson Lake Campground, Watson Lake, Yukon, Canada. Hey, I'm in the Yukon! Had to stay in the tent to avoid the killer mosquitos--those things are fast & thirsty. So far north that it doesn't get dark anymore. This will take some getting used to. But I'm so tired at the end of the day, that I can sleep through anything! Above: Crossing into the Yukon, Canada June 12 Yeeehaaaaaa!!!! June 13 & 14: Stayed at the Beez Kneez Hostel in Whitehorse, Yukon. Visited the Interpretive Center. Walked around Whitehorse and relaxed. Bought Julie the Canada Beany Bear. June 15: Dawson City River Hostel, Dawson City, Yukon. Very rustic, but comfortable. Met fellow hosteller from the Netherlands. She was backpacking around Canada, and wanted to ride with me to cross the Arctic Circle. We took the ferry across the Yukon River, drove over the "Top of the World Highway" to Poker Creek--the northermost US border (population 2). ARRIVED IN ALASKA!! Stopped in Chicken, Alaska for coffees. June 16: Grandma Shirley's Hostel, Fairbank, Alaska. I'm made up my mind--I've driven this far, so I'm going to drive as far north as possible--Deadhorse on Prudhoe Bay on the Arctic Ocean! Only 500 miles north of Fairbanks. The people in the Visitor Center asked me if I'll be driving a "rental". They said no on will rent to me if they know I'm driving over the Dalton Highway. Told 'em I'm driving my Kia. They said it would never make it. But I'm trying anyway--I'll go as far as I can! Two hundred miles to the Arctic Circle, then 60 miles to Coldfoot--the last services before Deadhorse--that's another 240 miles. Camped out in the woods right off the road near Coldfoot. June 18: Alaska Pipeline runs alongside the Dalton Hwy. Over the Brooks Range, across the Arctic Tundra. Got two flat tires and a cracked windshield. Exhausted (by this time in the trip I was used to being exhausted), I made it to Deadhorse! My little Kia made it! Looked around, did errands, mailed post cards, turned around and headed back towards Coldfoot. Drove 'til 2am. Slept in car in rest area. No tent tonight--it smells like peanut butter & jelly. Don't want to attract bears. Above: Crossing Brooks Range, still a long way to go to Deadhorse! That's the Alaska Pipeline on the far upper right of the photo. June 19: Denali/Mt. McKinley Hostel wouldn't be open until 5 pm. It was only 3 pm. I couldn't wait around. Drove on past Anchorage to Sheep Mountain Lodge & Hostel in Palmer, Alaska. Had to get there before it closed. Took longer than I thought. Hard mountain driving. Got there just before the restaurant closed. Phew! June 20: Drove to Tok, AL. Checked out Ferry schedules. Had to make it to Prince Rupert in 3 days to catch ferry. It would be a rush, if I missed the ferry, I'd have to wait a week for the next one. I had decided to take the ferry instead of backtracking through BC (there are not many roads to choose from--well, one actually.) So the ferry would be quicker and cover territory that I hadn't seen yet. 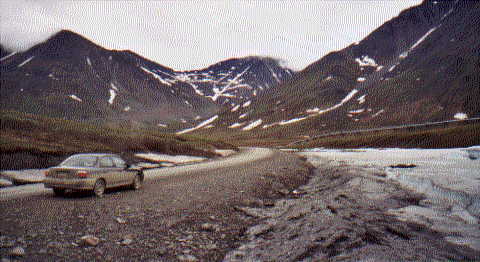 The Stuart-Cassiar Hwy. 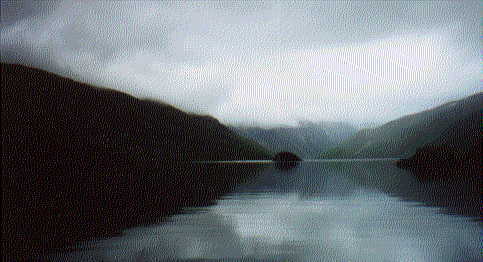 (Rt 37) was the only road to Prince Rupert. It was a winding mountain, dirt road totally isolated. There, I experience the first & only scare of the entire trip. For the first time in during my trip I actually feared for my life. June 21 & 22: Missed a turn (the only turn), so I went 40 miles out of my way & ended up in tiny Hyder, Alaska (Rt. 37A). Turned out to be OK because I got some great photos and saw an avalanche. After Hyder, had to turn around and go back 40 miles to the Stuart-Cassiar Hwy. there's only one way in and one way out. June 23 & 24: Got a little lax with my journal. Didn't take time to keep up with it. Lost or gained a day or two somewhere. Finally arrived at the Prince Rupert Campground. Rested for the night, ready to catch the "Queen of the North" ferry for the voyage through the breathtaking "Inside Passage", past the San Jaun Islands, to Port Hardy on Vancouver Island. I had decided to disembark in Port Hardy because it was a lot cheaper than taking the "Queen" all the way to Bellingham, Wa. Arrived very late in Port Hardy. Slept in car. Next day drove the length of Vancouver Island to the Nicol Street Hostel in Naniamo. Explored Naniamo discovered that there was a smaller ferry leaving Naniamo for mainland, BC.. I took it. June 25 - 30: Drove back to Birch Bay Hostel in Blaine, WA to recuperate, lay back a few days & rest. Ahhhh..
July 1: Left Birch Bay. Visited Ginko Petrified Forest & the Horse Sculptures in WA. Stayed at the Hostel of the Rockies in St. Ignatius, Montana. The hostel buil partially built underground--they called it an "Earthship". They also had Teepees available to stay in. I chose the Earthship. July 2: Visited Little Big Horn Battlefield. Got late & dark. Huge storm clouds were building. Slept in my car next to an RV at a Visitor's Center somewhere in Wyoming. 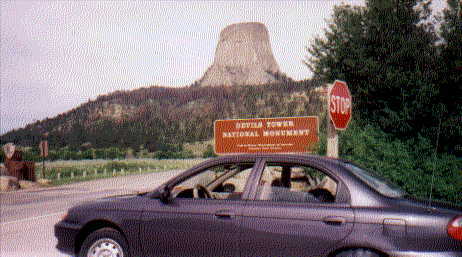 July 3 & 4: Visited Devil's Tower in Wyoming. Stayed at the Penny Motel & Hostel in Deadwood, South Dakota. It was a busy little tourist town. Hostel was nice & quiet. Had an air conditioned room to myself. Next day visited Mount Rushmore, Wall Drug, Badlands National Park. Stayed at a KOA Kampground in Sioux Falls, SD. July 5: Visited the Wind Farm in Storm Lake, the Grotto of the Redemption in West Bend, Iowa. Drove on to the Old Barn Resort & Hostel in Preston, Minnesota. Lots of crickets & fire flies at night. Peaceful. July 6: Chicago International Hostel. There are about 5 hostels in Chicago. While approaching Chicago from the highway I could see the skyscrappers towering about the clouds or mist or whatever. White knuckle time. The congestion, the noise, the traffic--I would have bypassed the city altogether, but my gas light had been on for some time. Damn, I shouldn't have procrastinated putting gas in. So I had no choice but to pull of the highway and look for a gas station. Luckily, I found one. And found a hostel near the lake. So that was a bonus. Walked the beach. But could not wait to leave early the next morning. July 7: Visited Gettysburg. Stayed at the Pittsburgh Hostel, PA. It was in the city, but wasn't as busy as the Chicago Hostel. Had the woman's dorm room to myself. July 8: Poconos Hostel, PA. Peace & quiet. Woods & solitude. Even a brook outside my window to listen to. Cool breeze. One other hosteller there. We each had our own room. July 9: It's been 91 days on the road! Next stop Home! Massachusetts! It's been great! Experienced every emotion possible during this trip! Almost beyond words. If you've never done it--there is nothing to prepare you for driving through a winding, windy canyon (and later in the dark). What looks like a little crack (where the arrow is pointing) is where scenic route 95 enters into the canyon. I have since learned that it's called the Bicentennial Highway. And that I had driven 133 canyon miles from Blanding to Hanksville, UT. That's not counting the drive from Durango, to Four Corners, and from Four Corners to Blanding. It was a long drive under a variety of conditions. Two things that did not change were the heat & the wind! The wind was unbelievable! Someday I'd like to back there so I can enjoy it this time. 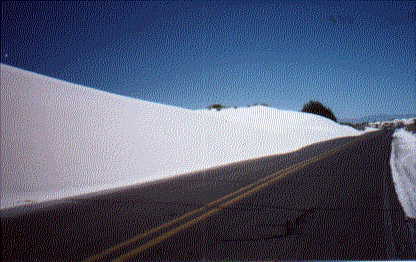 To learn more about Death Valley: Click here for the Death Valley National Park Website. --282 ft. below sea level! To find out more details, click on the blue, underlined words below, and you will be brought to a full page devoted to that particular place.